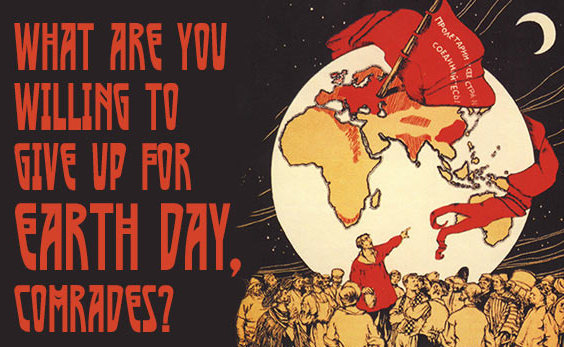 Comrades, Earth Day™ is just around the corner. 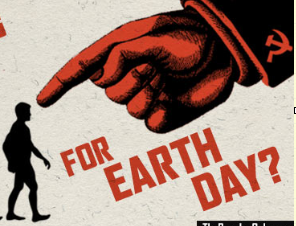 We’re not talking about Christmas or Easter or Yom Kippur, we’re talking about Vladimir Lenin’s Birthday, the recognized Communist leader that is responsible for the deaths of millions of you carbon spewing polluters.! Forgiveness? Are you serious? When it comes to the Green Gospel, there’s only one solution, and that’s extermination. If it wasn’t for man, Bambi’s mother would be alive today instead of having her head mounted over some redneck’s fireplace desecrated with a bandanna and non-union manufactured sunglasses. So who’s guilty, you ask? Probably you. One happy day, perhaps Next Tuesday™, our government will be empowered to recycle its non-productive, Earth exploiting citizens. It’s called giving back, and it’s the only way you can redeem yourself. If we don’t take action now, all the furry animals will be dead in just ten years. But until Next Tuesday comes along, you need to do your part. You need to confess your guilt. You need to give back. So in the days leading up to Earth Day, you need to tearfully, publicly, and loudly proclaim your sins against Mother Earth. You need to publish your shame by wearing awareness ribbons and riding a bicycle. In so doing, you induce feelings of necessary guilt in others, and you get a smug sense of self-righteous satisfaction because you care more.